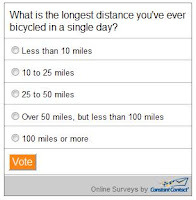 Century Cycles Blog: Poll: What's your longest bike ride? We recently heard from two of our long-time Night Ride on the Towpath Trail participants that they just completed their first "century" ride, i.e. 100 miles in one day. We also received an email from a recent rental bike customer telling us that she rode 6 miles. With that being her first time riding a bike in 15 years, it inspired her to take up cycling on a regular basis to improve her health. Both of these stories are inspiring to us in many ways, proving that the joys of cycling are within reach for anyone. They also inspire us to wonder about you, our readers, What is the longest distance you've ever bicycled in a single day? Click here to take our latest online poll and let us know! Last month's poll asked, "What's in your water bottle during a long bike ride on a hot day??" The unequivocal winner, at 53% of all votes, was "Plain ol' water." Nearly tied for second-place at 20% and 19% each were "Sports drink, like Gatorade or Powerade" and "Water with dissolvable electrolytes, like Nuun tablets." You can see the full results of the last poll here.